In the recent twist in a two-month border standoff between India and China over the Doklam Valley in the Himalayas, Beijing said that India "is slapping its own face" by deciding to build a road near Pangong Lake in Ladakh where soldiers of the two armies reportedly clashed earlier this month. India's Defense Ministry has recently said that it intends to speed up construction of roads along the border with China citing it as a crucial requirement for faster movement of troops and uninterrupted supplies of ammunition and other necessities. The statement has obviously added fuel to the two-month border standoff between the two countries. "This report makes me feel that India is slapping its own face," China's Foreign Ministry Spokesperson Hua Chunying said during her regular press conference on Thursday when asked to comment on the statement. "The Chinese side constructs roads on its own territory, but India illegally crossed the boundary to obstruct that under the so-called pretext of 'security concerns.' Now the actions of India exactly prove that on the relevant issues concerning the China-India boundary, India's deeds cannot match its words and what it did is inconsistent and contradicts with what it said." "The western sector of the China-India boundary has not been delimited. China and India have agreed that pending the final settlement of the boundary issue, they will make concerted efforts to uphold the peace and tranquility of the border area. India's construction of the infrastructure which is obviously for the military purpose near the Line of Actual Control in the western sector cannot help to uphold the peace and stability of the western sector of the China-India boundary or ease the current situation of the boundary between the two countries," Hua Chunying said. 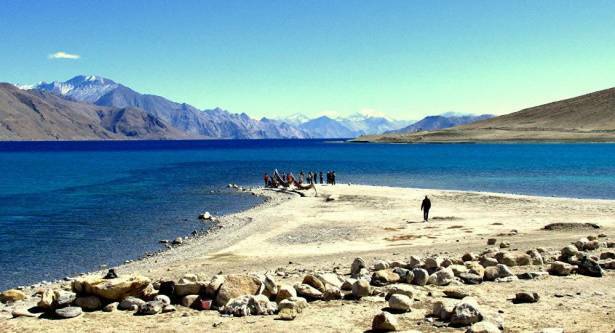 India's Defense Ministry's urge to expedite the road construction comes in the follow-up to the reports of the Indian media that Indian and Chinese soldiers clashed on the banks of Pangong Lake in eastern Ladakh on August 15 "with stone-pelting, kicking and punching, throwing of stones, and using of sticks and steel rods, leading to severe injuries." ​According to a report in The Indian Express, the video of a suggested scuffle was posted by Lt Gen Prakash Katoch (retd) on his Facebook page on August 19. The outlet however added that there was no confirmation of the authenticity of the video. However a day before the video surfaced, the spokesperson of the Ministry of External Affairs "had confirmed 'an incident,' without going into details." Meanwhile, India's Union Home Minister Rajnath Singh said on Monday that the ongoing standoff between the Chinese People’s Liberation Army (PLA) and the Indian Army at Doklam "will be resolved soon and China is also inclined towards it [finding a solution],” according to The Hindu newspaper. "We expect a positive move from China soon," the newspaper quoted Rajnath Singh as telling reporters at a pipping ceremony of Indo-Tibetan Border Police (ITBP) jawans posted along the China border.